Lightly fold 8 Old El Paso™ flour tortillas for (8 inch) in half and place folded-side-down in dish; set aside. In 10-inch nonstick skillet, cook 1 lb (500 g) lean ground beef with salt to taste over medium-high heat, stirring frequently, until no longer pink; drain. Transfer to large bowl. Add 1/4 cup mild enchilada sauce, black bean or corn salsa and 1 cup of the shredded Mexican four-cheese blend; stir to combine. Divide beef mixture evenly among tortillas; wrap tortillas around filling and place seam side down. Pour remaining mild enchilada sauce and remaining 1 cup shredded Mexican four-cheese blend over enchiladas. Spray sheet of foil large enough to cover baking dish with cooking spray. Cover baking dish with foil, sprayed side down. Bake 40 to 45 minutes or until hot and bubbly. To freeze: Spray 2 (8-inch) disposable foil cake pans with cooking spray. After covering pans with sprayed foil, place in gallon-size resealable freezer plastic bags, or wrap in double layer of plastic wrap. Label and freeze. To bake: Thaw overnight in refrigerator. Heat oven to 350°F. Remove from plastic, and place foil-covered pan(s) on cookie sheet. Bake 35 to 40 minutes or until instant-read thermometer inserted in centre reads 165°F. If baking from frozen, bake 1 hour, then remove foil and bake 10 to 15 minutes. 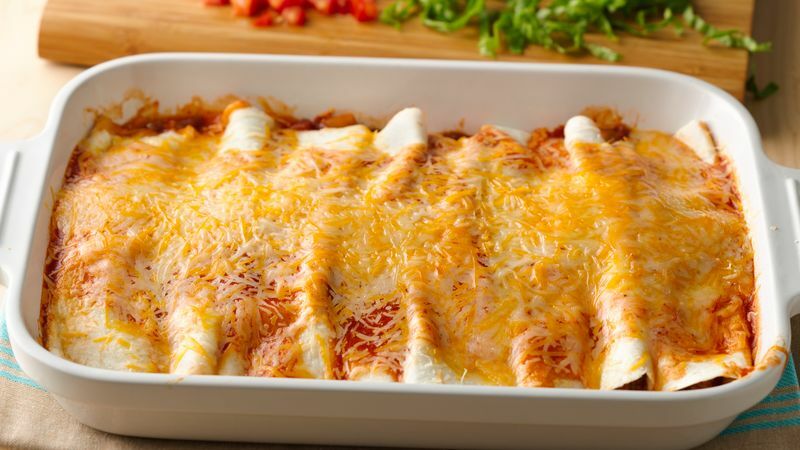 Bean salsa, corn salsa or a mix of both make these easy enchiladas special, but any salsa will do in a pinch. Shredded lettuce, guacamole, salsa and sour cream all make great garnishes for this easy baked dinner.